Water is a chemical compound needed by most plants and animals on Earth in order to sustain life. Pure water is a tasteless, odorless, transparent liquid. In small amounts it is colorless, but it takes on a bluish tint in larger amounts. Water is an excellent solvent and as a result it usually contains a wide variety of dissolved minerals and other chemicals. It can also carry and support bacteria. Most of the water distributed through municipal water systems is treated to remove harmful substances. Some bottled waters undergo even further treatment to remove almost all impurities. The English word water is derived from the German word wasser, which in turn is derived from an ancient Indo-European word meaning to wet or wash. The controlled use of water dates to at least 8,000 B.C. when farmers in Egypt and parts of Asia trapped floodwaters for crop irrigation. The concept of using irrigation canals to bring water to crops, rather than waiting for a flood, was first developed about 2,000 B.C. in Egypt and Peru. By about 1,000 B.C. , the city of Karcho, in what is now Jordan, built two aqueducts to bring an adequate supply of water for the city's population. This is the first recorded instance of a planned municipal water supply. Early water treatment was surprisingly advanced, although rarely practiced. An ancient Sanskrit manuscript, from what is now India, advises that drinking water should be kept in copper vessels, exposed to sunlight, and filtered through charcoal. Ancient Egyptian inscriptions give similar advice. Many of these methods are still used today. In about 400 B.C. , the Greek medical practitioner Hippocrates suggested that water should be boiled and strained through a piece of cloth. Despite these early references, most people drank untreated water from flowing streams or subterranean wells. As long as there were no sources of contamination nearby, this was a satisfactory solution. As the population of Europe and other parts of the civilized world grew, their sources of water became increasingly contaminated. In many cities, the rivers that served as the primary sources of drinking water were so badly contaminated with sewage that they resembled open cesspools. Cholera, typhoid, and many other water-borne diseases took their toll. In 1800, William Cruikshank of England demonstrated that small doses of chlorine would kill germs in water. By the 1890s, several municipalities found that slowly filtering water through beds of sand could also significantly reduce the incidence of disease. The public outcry for safe drinking water reached such a crescendo that by the early 1900s most major cities in the United States had installed some sort of water treatment system. Even with water treatment, water contamination remained a serious concern as an increasing amount of industrial wastes poured into the nation's rivers and lakes. As the adverse health effects of lead, arsenic, pesticides, and other chemicals became known, the United States federal government was obliged to pass the Water Pollution Control Act of 1948. This was the first comprehensive legislation to define and regulate water quality. It was followed by a series of increasingly tougher requirements, culminating in the current Environmental Protection Agency (EPA) water quality standards. In addition to the federal standards, most states have their own water quality laws, and some state laws are more stringent than those specified by the EPA. Pure water is an almost non-existent entity. Most water contains varying amounts of dissolved minerals and salts, plus an abundance of suspended particles such as silt and microscopic organic material. Different types of water are classified by the presence or absence of these impurities. Tap water, or municipal water, has under-gone a series of treatments to kill harmful bacteria, remove sediments, and eliminate objectionable odors. It may also have had one or more chemicals added for a variety of reasons. Hard water contains high amounts of calcium and magnesium salts. This causes soap to form curds. Hard water is further divided into temporarily hard water and permanently hard water. Temporarily hard water contains bicarbonates of calcium and/or magnesium, which react to form a hard substance called scale when the water is heated. Scale can clog hot water heaters and pipes and leave deposits on cooking utensils. Permanently hard water contains sulphates, chlorides, or nitrates of calcium and/or magnesium, which are not affected by heating. Soft water contains relatively low amounts of calcium and magnesium salts, although the definition of "low" varies. The term "softened water" refers to hard water that has had enough salts chemically removed to avoid forming soap curds. It is high in sodium chloride. If water contains a large quantity of dissolved minerals, it is called mineral water. Mineral waters can be divided into five main classes: saline, alkaline, ferrunginous, sulphurous, and potable. Saline water has a high level of sodium or magnesium sulphate or sodium chloride. Alkaline water has a high concentration of salts which give it a pH in the range of about 7.2-9.5, where a pH of 7 is neutral and a pH of 14 is highly alkaline. Ferrungious water is rich in iron, which gives it a rusty color. Sulphurous water is rich in sulphur compounds and is distinguished by its rotten egg smell. Potable water has a mineral content of less than 500 parts per million and is most commonly bottled and sold as a specialty drinking water. Carbonated water, soda water, and sparkling water all contain dissolved carbon dioxide. This may occur naturally where limestone or other carbonate rocks are present, or the carbon dioxide may be added artificially under pressure. Spring water and artesian water are distinguished only by the fact that they flow from the ground naturally without the aid of drilling or pumping. Otherwise, there is nothing that makes them different than water from other sources. Distilled water has been purified by an evaporation-condensation process that removes most, but not all, impurities. Deionized water has been purified by an ion-exchange process, which removes both positive ions, such as calcium and sodium, and negative ions, such as chlorides and bicarbonates. It is sometimes called de-mineralized water. Purified water is municipal water that has undergone carbon filtration, distillation, deionization, reverse osmosis, ultraviolet sterilization, or some combination of these processes to remove almost all minerals and chemical elements, both good and bad. A water molecule consists of two atoms of hydrogen bonded to one atom of oxygen. The chemical symbol is H 2 O. Water usually also contains a wide range of organic and inorganic materials in solution or suspension. In the process of treating water for use in a municipal system, several chemicals may be added. These include disinfectants like chlorine, chloramine, or ozone; coagulantants like aluminum sulfate, ferric chloride, and various organic polymers; acidity neutralizers like caustic soda or lime; and chemicals to help prevent tooth decay in the form of various fluoride compounds. receives no treatment. Other water, such as the water used to make pharmaceuticals, is highly purified. 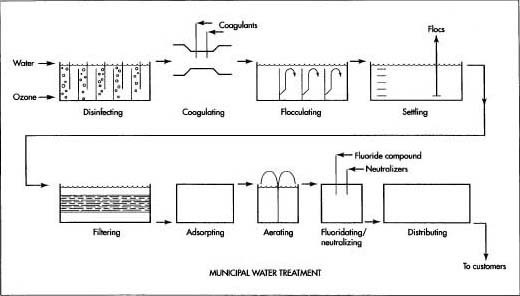 Here is a typical series of operations used to treat municipal water for distribution to homes and businesses. 1 Most municipal water comes from two sources: ground water and surface water. Most ground water is tapped by drilling wells into the underground water-bearing layer called the aquifer. Some ground water rises naturally in the form of springs. Surface water is tapped by impounding rivers behind dams. The surrounding area that drains into the rivers is called the watershed. In many cases, access to and use of the watershed is limited to prevent contamination of the runoff water. 2 From the well or dam, the water is carried to the water treatment plant in open canals or closed pipes. In some cases, the water supply is close to the municipality. In other cases, the water has to be transported many hundreds of miles (km) to reach its destination. Sometimes the water is stored in intermediate reservoirs along the way to ensure that there will always be an adequate supply available to meet a city's fluctuating needs. 3 In some water treatment plants, the water is initially disinfected by contact with ozone-rich air in a series of chambers. This step is used by most plants in Europe, but only a few plants in the United States. Ozone (03) is formed by passing compressed air through a high-voltage electric arc. This causes some of the oxygen (02) molecules in the air to split in half and reattach themselves to other oxygen molecules to form ozone. Ozone effectively kills most germs and also destroys compounds, which cause unpleasant tastes and odors. It has a relatively short life, however, and does not remain in the water to protect it during storage and distribution. For this reason, a small dose of chlorine or chloramine is added to the water at the end of the treatment process. 4 The water then passes through a flash mixer where chemicals known as coagulants are rapidly mixed with the water. The coagulants alter the electric charge around any suspended particles in the water and make them attract each other and clump together, or coagulate. 5 The water moves slowly through a series of chambers where it is gently mixed by the swirling flow. As the water mixes, the charged particles continue to bump into each other and form even larger particles called flocs. 6 The water flows into a settling basin or tank where the heavy flocs sink to the bottom. Some settling basins have two levels to double their capacity. The material that settles to the bottom is vacuumed out of the basin with a device like a pool vacuum and is deposited in a solids holding basin. The trapped material from the filter (step 7) is also added to the solids holding basin. These combined materials are sent through a gravity thickener and then a press where most of the water is squeezed out. The remaining solids are loaded into trucks and transported to a landfill for disposal. 7 The partially cleaned water passes through several layers of sand and pulverized coal, which trap any very small particles that remain in the water. Some harmful organisms are also trapped this way in those water treatment plants that do not use ozone as an initial disinfectant. The filter layers are back-flushed periodically to remove the trapped material. 8 In some plants, the water is passed through a bed of activated charcoal granules. Chemical contaminants in the water stick to the surface of the charcoal in a process known as carbon adsorption. 9 In some areas where the water contains undesirable amounts of iron and manganese or certain dissolved gases, the water is sprayed into the air from large basins to aerate it. When the water mixes with the air, it picks up oxygen, which causes some of the contaminants to settle out. Other contaminants are removed by evaporation. 10 In some water treatment plants, a fluoes ride compound is added to the water to help prevent tooth decay. Fluoride occurs naturally in some water supplies and additional amounts are not required. In the past, fluoridation has been a hotly debated subject, and not every municipality adds fluoride to their water. 11 Other chemicals may be added to the water to help reduce corrosion in pipes and plumbing fixtures. This is done by adding controlled amounts of certain chemicals to adjust the pH factor to a neutral level. 12 As the water leaves the treatment plant, it receives a small dose of chlorine or chloramine to kill any harmful bacteria that may have found their way into the distribution system. If the plant does not use ozone as an initial disinfectant, a larger amount of chlorine or chloramine is added to the water. 13 After the water leaves the plant, it is usually stored in covered tanks or reservoirs to protect it from contamination. In some areas, these storage facilities are located at a higher elevation than the surrounding terrain, and the water is pumped up into the tank or reservoir. This elevated storage position provides the pressure necessary for adequate flow through the water mains and pipes within the city. In other cases, the water is stored in ground-level facilities, and the pressure is supplied by electric pumps that run on demand. The federal and state water quality standards set maximum contamination levels for more than 90 organic, inorganic, microbiological, and radioactive materials that may be found in water. These standards are further divided into primary standards, which cover materials that may be harmful to humans, and secondary standards, which cover materials and properties that may affect aesthetic qualities such as taste, odor, and appearance. A typical water district may perform more than 50,000 chemical and bacteriological analyses of the water supply each year to ensure the standards are being met. The public's concern over safe drinking water is expected to result in even more stringent water quality standards in the future. Ironically, one of the most recent concerns is not about outside contamination, but about the effects of one of the substances commonly used to disinfect water—chlorine. Studies within the last 30 years have shown that chlorine forms certain compounds with the organic materials found in water. The most common compounds are called trihalomethanes, or THMs, which have a 1-in-10,000 risk of causing cancer when ingested or inhaled over a long period. One alternative to using chlorine is chloramine, which is a combination of ammonia and chlorine that does not form THMs as readily. Many water treatment plants have already switched to chloramine. Other alternative disinfectants include ozone, ultraviolet light, chlorine dioxide, and a hybrid of ozone and hydrogen peroxide called peroxone. von Wiesenberger, Arthur. H 2 O: The Guide to Quality Bottled Water. Woodbridge Press, 1988. Water Quality Standards Handbook, 2nd edition. United States Environmental Protection Agency, 1994. Arrandale, T. "A Guide to Clean Water." Governing (December 1995): 57-60. Wasik, J. F. "How Safe is Your Water?" Consumers Digest (May/June 1996): 63-69. "Alameda County Water District Water Treatment Facility." Pamphlet. Alameda County Water District, 1993. "Layperson's Guide to Drinking Water." Pamphlet. Water Education Foundation, 1995. Los Angeles Department of Water and Power. http://www.ladwp.com .